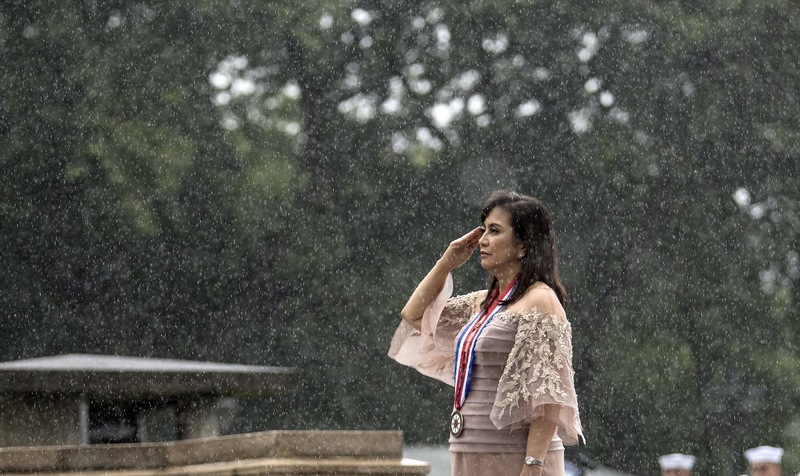 Vice President Leni Loud Robredo received some cheers from her supporters last June 12, 2018 for honoring the flag under the rain. She developed pneumonia a few days later. She was seen not feeling well before she could report for duty. An ambulance from the Patrick Star Hospital arrived to take her to the hospital. Her admission to the hospital gave a mixed reaction from the public. Some say that she should be celebrated for risking pneumonia to honor the Philippine flag. Others laughed and jeered at what they called as a lack of common sense. Someone even said that she should have worn a raincoat doing the salute because it was a very risky move. Others even say that the vice president has a severe lack of common sense. She was last seen rushed into the hospital diagnosed with high fever, sweating, chills and extreme fatigue. She was seen unable to recognize some people. Her daughters went to visit their mother. President Rodrigo R. Duterte went to the hospital to visit her. The palace has no word yet concerning her condition after she caught pneumonia. People are advised to stay tuned for further developments on her condition.